Home Model Trains	TS028: *LIVE* Model Railroad Software, 10K Giveaway Launch, and bad/good news! TS028: *LIVE* Model Railroad Software, 10K Giveaway Launch, and bad/good news! 1. The official announcement of the 10K Giveaway Sweepstakes. 2. Bad news, good news, bad news, and good news. 3. 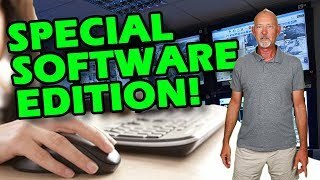 With whatever time remains, we’ll be talking about computer software for your model railroad layout. Our N gauge layout is featured in both Track Smack, and It’s My Railroad showing you tips, techniques, and failures from a regular guy point of view. Whether you are enjoying Z scale, N Scale, HO Scale, or any other scale of model railroad layout, we know you will enjoy every episode and probably learn a little something along the way. So, what are we waitin for? Lets get on this right now! NOTICE: THIS IS NOT A CHARITY EVENT. PLEASE REFRAIN FROM REFERRING TO IT AS SUCH AS IT MAY POTENTIALLY MISLEAD OTHERS. INTRODUCTION: The intent of this sweepstakes is to have fun as a community and to bring a heightened awareness to the It’s My Railroad YouTube channel. Any rule, or modifications of them, are intended to meet that end. Therefore, It’s My Railroad reserves the right to modify these rules, or to cancel the sweepstakes at its sole discretion, with or without notice. POINTS SYSTEM: The 10K Giveaway Sweepstakes is a contest in which participants can earn points by properly identifying clues that will be given out on each Track Smack Episode. Once the clue has been given, those who wish to participate have exactly 24 hours to send an email containing the clue to It’s My Railroad. The email MUST contain the exact phrase “10K Giveaway” in the subject line, must be time stamped within the 24 hour window, and contain the proper identification of the clue. E-mails that are not properly formatted are subject to disqualification at It’s My Railroad’s sole discretion. Only one of these emails will be excepted per episode. All emails should be sent to: steve@dirtguymedia.com. For each properly formatted and accepted email, the participant will receive 5 points. These points will be tracked week to week. The participant will be identified internally by their email address. This information will not be shared with anyone outside of the Dirt Guy Media organization. BONUS POINTS: A maximum of 100 bonus points can be earned by making contact with model railroad manufacturers, or hobby stores in an effort to have locomotives, rolling stock, and/or caboose supplied as the grand prize for this contest. . The email addresses are for various companies within the hobby that we are soliciting the grand prize from. This list is not exhaustive, and participants are encouraged to contact other manufacturers or hobby stores at their sole discretion. For each email the participant sends to once of these addresses, 5 bonus points will be awarded and tracked based on the participant’s email address. As proof of the email, the participant will need to “cc” steve@dirtguymedia.com on the email. If there is no way to “cc”, then a screen capture of the drafted email will suffice at It’s My Railroad’s sole discretion. OTHER POINTS: From time to time It’s My Railroad may offer other clues or bonus points for actions not included in this official rule set. It’s My Railroad reserves the right to do so at its sole discretion. DETERMINING A WINNER: At such time as 10,000 YouTube subscribers is reached on the It’s My Railroad YouTube channel, the following Saturday morning the sweepstakes will be declared over. Within two weeks, and no more, the winner of the sweepstakes will be announced. The winner of the sweepstakes will be that participant who has accumulated the most points. In the event of a tie, the relevant names will be placed in a hat and randomly drawn. There will be a total of three winners. PRIZES: The winner of the sweepstakes will receive a special edition, It’s My Railroad, commemorative train that will be DCC ready. The train is to be custom painted but not weathered. The winner will be able to select from either an (N) scale version, or an (HO) version. The two remaining winners will be awarded a$200 gift certificate, and a $100 gift certificate respectively. CHARITY: The remaining commemorative train is to be auctioned off on eBay. All proceeds from this auction will be donated to a charity that will be partially (or wholly) determined by the It’s My Railroad Community.